If you have bubblers, bongs or glass in your cannabis smoking, vaping or dabbing paraphernalia, at some point you’re going to have to bite the bullet and clean your stuff. Failing to keep up with your cleaning regime not only makes your pipe look unsightly but can also be hazardous to your health. All that buildup of tar and other toxins is bad for your health. It doesn’t taste great either. Neither is it particularly hygienic. While cannabis users have the reputation for not necessarily being friends of the vacuum cleaner and washing the dishes, they do generally take pride in their kit. The good news is it’s pretty simple to learn how to clean a glass pipe. Even with just a few household items and a little hot water, your bong or pipe could be as good as new in next to no time. There is some etiquette here about what you should be using and cannabis connoisseurs can get a little hot under the collar when talking about it. We’re lazy. That’s not just a cannabis users thing, many people look at their glass pipe and simply can’t be bothered to give it a good clean. At least not until it’s trapped with gunk. We don’t want to damage it. All those washing liquids and other chemicals are going to make it bad for smoking, right? Wrong. You are likely to maintain your glass pipe better if you actually clean it once in a while. We like a dirty glass pipe. Some people do actually like the way that build up of tar and other toxins makes their pipe look and taste. Each to their own but it’s still pretty unhealthy. And, if you’re in a social situation, it’s best not to hand your pipe around. We don’t smoke cannabis socially so we don’t have to worry about cleaning our glass pipe in the first place. If you’re not worried about your own health, fine. We can’t convince you. But what about the taste? We’ve never learned how to clean a glass pipe. Which is good. This article is all about just that. Enjoy. We hope it will bring you a whole new experience. We don’t 100% recommend this method as it uses rubbing alcohol which can be toxic if ingested. But it is the pipe cleaning method that a lot of people use, particularly cannabis connoisseurs. It’s actually the one that cannabis experts get hot under the collar about. We advise you only use this if you have a very dirty pipe ingrained with lots of gunk. For all other cleaning, use a natural, green alternative as outlined below on a regular basis. A bottle of rubbing alcohol that has a high concentration of isopropyl. Sea salt to act as a scouring agent. A sealable bag you can soak your pipe in. Cotton swabs, pipe cleaners and some gloves. Isopropyl alcohol actually works well because it has a similar structure to the resin in cannabis and acts on the basis that like usually dissolves like. It’s one of the main reason why regular cannabis users like this method because it can get rid of that deep ingrained gunk. First of all, get as much of the tar out by rinsing in hot water and using your pipe cleaner and cotton buds to dislodge any staining. 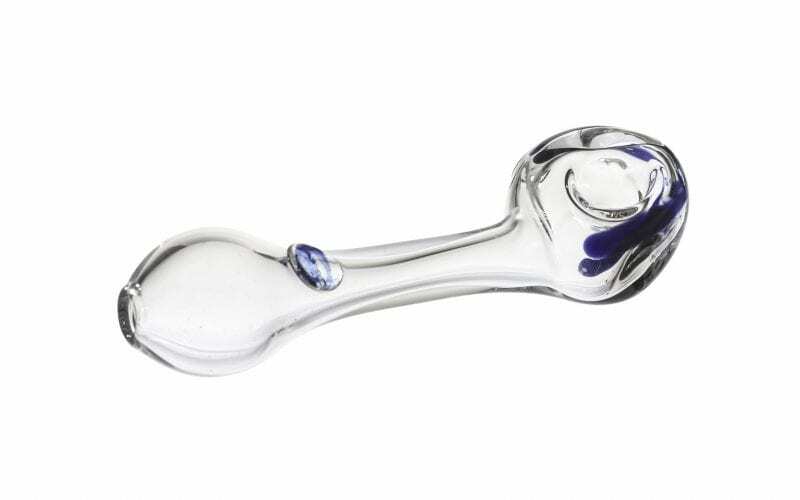 Because this is a glass pipe you need to be gentle. If you’re too rigorous you can easily crack something and then your pipe will be completely useless. Take your sealable bag and put some rubbing alcohol and salt in it. The salt is abrasive so should help remove the hardened gunk. Seal the bag with your pipe inside and give it a good shake. This process can take a little while so don’t get impatient. With the bits removed, you will find the liquid changing color to a muddy brown. Continue shaking for about two minutes and then empty the bag out. Rinse the pipe under a tap to get rid any more residue. Next, repeat process all over again. Keep on doing this until the liquid remains clear or you can’t see any more gunk. Give your pipe a final thorough rinse under the tap until you are sure you’ve removed all the rubbing alcohol. Don’t skimp on the rinsing, unless you want the taste of rubbing alcohol in your mouth afterwards. Place your pipe on the side where it can drain and dry out. Yes, cleaning can be a bit of a chore, but it has to be done. You could, of course, simply throw your glass pipe out once it gets too dirty and buy a new one. But why waste that money when you could have a clean pipe in next to no time? Ask around and you’ll find there are quite a lot of different methods out there. We all have our personal preferences. Tar and toxins can coat the inside of your pipe and they can be pretty difficult to dislodge once you get a buildup. Do clean your glass pipe regularly. It’s easier that way. In actual fact, we recommend that you clean it after each use. It takes just a few days of regular use for tars to build up and problems like mold to start occurring. We appreciate you’re probably not going to do this but we thought we’d mention it. A quick rinse through with hot water can make all the difference. Do get yourself a good, environmentally friendly cleaner that you can use without damaging the world around you. You can add a few drops to your bong water as well which should help stop tars building up in the first place and hopefully won’t have any effect on you. This works best if you are cleaning regularly. There are a lot of people who use isopropyl alcohol as above. The trouble is this is actually very toxic and not good for you in the long term. Speak to a cannabis connoisseur and they’ll tell you it’s perfectly safe to use as long as you rinse your pipe out properly. We suggest that you DON’T use it at all if you’re a beginner. In fact, you shouldn’t be using anything that you wouldn’t be happy to ingest and that includes nail polish remover that has an acetone base (another favorite with some cannabis users). If you do have a very dirty pipe, it can be used to clean on rare occasions such as this. Just make sure you rinse everything through thoroughly afterwards. If you are cleaning your bong or glass pipe after each use, as you should be, these products can end up being expensive anyway. Find something natural and less costly. There’s plenty you’ll find in your kitchen cabinet that will work just as well. There are couple of solutions you might like to try. The first is simple salt and vinegar or baking soda and vinegar. All you need to do is soak your pipe in these for about half an hour and then rinse out. You might even like to try denture tablets. Some say they work but we’re not entirely convinced. Another option is to boil your pipe. Fill up a pan with water, bring it to the boil, put your pipe in and simmer for half an hour. If there are still residual bits left over, you can remove these using a pipe cleaner or a piece of wire with tissue wrapped around it. The only problem is, if you have a delicate pipe, this can damage it. Most of these methods work if you clean your glass pipe on a regular basis. Again, that’s what we suggest you do. Get into the habit of soaking your pipe after you’ve used it and you won’t have to worry about any build up of residue in the future. Your smoke will be nice and clean and flavorsome each time too. You can use similar methods to clean any glass paraphernalia such as bongs or bubblers. Of course, some bongs can be pretty intricate and cleaning them is no easy thing. They can also be fragile which is why you should never, for instance, stick them in the dishwasher. Our advice, at Seedsman.com, is to put in place a regular cleaning regime to stop too much residue building up. If that’s not your bag and you are just too lazy, there’s always rubbing alcohol, salt and a ziplock bag.